The United Nations High Commissioner for Refugees (UNHCR) said it has never encouraged the refugees living at the Thai-Myanmar border to return home and it has only provided necessary assistance. 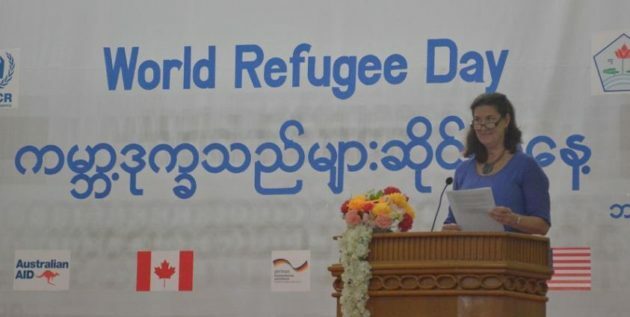 The UNHCR (Hpa-an office) head Ms. Maureen McBrien said this during the World Refugees Day ceremony on June 20. “The UNHCR can only work in Myanmar under an invitation from the government. Currently, the UNHCR from Southeast [Asia] has been assisting the government with the reparation of the refugees from Thailand. We didn’t encourage them to return in large numbers. We collected surveys only when they wanted to return home. We provided necessary assistance for resettlement,” she told reporters at the end of the ceremony held at Zwe Kabin Hall in Hpa-an, Karen State on June 20. Around 100,000 refugees are still living in nine refugee camps along Thai-Burma border and some of them returned home under the program arranged by the Thai and Burma governments on October 26, 2016 and May 7, 2018. Besides accepting the returning refugees from the refugee camps at the border, the Karen State government said it has also provided necessary assistance to the refugees by cooperating with international aids organizations. Over 100 people from civil society organizations, government departments, and the public attended the World Refugees Day ceremony, which was jointly hosted by the Karen State Department of Social Welfare and the UNHCR. A message from the Karen State Chief Minister Nan Khin Htwe Myint and a formal message from the UN High Commissioner for Refugees were read and former residents of refugee camps shared their experiences on returning home. “The UNHCR invited me to share my experience at this ceremony. I lived in Umpiem refugee camp for over ten years. I came back last month. I came back because I couldn’t live long in another country. They provided assistance at first when we first returned. Now, I have to depend on my relatives. Things will not work out well at first in your return if you don’t have any background here,” said Saw Ngwe Thein, participant of the ceremony, told Karen News. The UNHCR has been marking the World Refugee Day in the Karen State since 2016 but this was the first time it cooperated with the State Department of Social Welfare. The World Refugees Day is observed to draw attention from the government or other organization to the plight of the refugees who had to leave their homes and show recognition towards the refugees, according to Ms. Maureen McBrien. According to statistics released by The Border Consortium in May, 2018, 97,496 refugees remain in nine refugee camps along Thai-Myanmar border. Thousands of IDPs are also living in Hpa-pun and Myaing Gyi Ngu areas in the Karen State without being able to return home. The World Refugees Day was observed in Dawei, Tanintharyi Region, the Karen State, and the Kayah State in Burma and refugee camps at the Thai-Burma border.